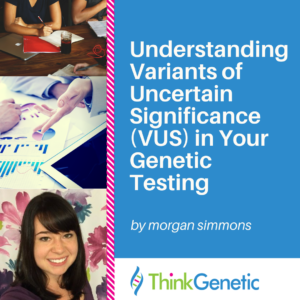 The acronyms VUS and VOUS stands for “variant of uncertain significance.” Just as it sounds, a VUS means that your genetic testing found a variant or change in one or more of your genes, but that the lab doesn’t know if the change(s) is disease-causing. “But,” you might ask, “isn’t it the lab’s job to know?” Yes, it is, but it is more complicated than that. Let me explain further. We all have genetic changes. A lot of them it turns out. You may have heard the fact that we are all 99.9% identical to one another. Although this sounds like we’re almost identical, our genetic makeup consists of approximately 3 billion nucleotides. Nucleotides are the molecules that “spell” out our genes providing our body with the instructions it needs to grow, develop, and function. That 0.1% difference equates to almost 3 million differences or “spelling changes” between each and every one of us. That’s a lot of changes. When nucleotide changes are found, laboratories use information from multiple families with that exact change, scientific literature, prediction tools, and various other biological studies to determine whether a change is disease-causing. If a change has never been seen before, there’s not a lot of information for laboratories to use to make their decision. They know that the change is not usually seen in average humans, but they aren’t certain what the change means for someone who has it. Don’t fret. You’re not alone. You probably ordered genetic testing thinking that you would get a straightforward, “yes” or “no” result. Getting an answer that essentially equates to a “maybe” is bound to be frustrating for some individuals. Have patience. Once more information is obtained and the VUS has been reclassified, many laboratories will contact the ordering provider so that you can be informed. So, it’s important to stay in touch with the provider who ordered your testing! Even if the laboratory hasn’t contacted your provider, you can ask your provider to call the laboratory for an update. You are the person who is most invested in knowing if the VUS has been reclassified – advocate for yourself. In fact, depending on the change and the health issues seen in the person with the change, there may be patient-focused projects where you can actively seek answers. Examples of these projects include the “Simons Variation in Individuals Project” (Simons VIP) an online community that supports families with rare genetic changes associated with features of autism spectrum disorder and developmental delay and the “Free the Data” project for individuals with a VUS in either BRCA1 or BRCA2. Many, but not all, laboratories will offer to do family studies for free if a VUS is found. Family studies involve testing other relevant or informative family members to determine where the VUS originated. Although these studies are typically free of charge, they can require a bit of effort by both the provider and the patient to coordinate testing for these family members. There are also projects through different institutions that may help with this process. For example, the University of Washington’s “Find My Variant” project works with individuals to identify and collect DNA samples from their family members to learn more about their VUS. After a VUS is found, providers will typically consider additional family studies, other genetic tests, and research studies. If the VUS is still the only genetic finding, management will vary depending on the gene in which the VUS was found, the exact variant, and personal/family history. Broad statements about the management for individuals with a VUS cannot be made. This makes it important to have a geneticist or genetic counselor involved who can recommend appropriate management options. Contact a genetic counselor in your area to discuss your genetic test results and if any additional testing/research is needed. You can search for a genetic counselor near you by using the ‘Find a Counselor’ tool sponsored by the National Society of Genetic Counselors. 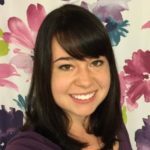 About Morgan Simmons – Morgan is a graduate student at Emory University’s School of Medicine pursuing a Master of Medical Science in Human Genetics and Genetic Counseling and a Graduate Student Intern at ThinkGenetic, Inc. Thank you so much for reaching out to Morgan. We have sent your contact information to her for follow-up and removed your confidential data from the blog and server. We wish you all the best in your search for answers for your child. Morgan should be following up soon.